Several definitions of HNS are available; however the OPRC-HNS protocol definition is the one that will be used in the HNS-MS project. solid bulk material with associated chemical hazards. The HNS-MS project considers also vegetal oils as HNS. The Protocol covers pollution incidents or a threat of a pollution incident from HNS, such as a discharge, release or emission of HNS including those from fire or explosions, which pose or may pose a threat to the marine environment, or coastline, and would, therefore, require emergency action or an immediate response. HNS covers a wide range of chemical substances that have diverse intrinsic qualities (such as toxicity, flammability, corrosiveness, and reactivity with other substances or auto-reactivity) and behaviours in the marine environment acting as evaporators, sinkers, floaters or dissolvers. More than 2,000 HNS are regularly carried by sea either in bulk or packaged form. In addition to pipelines, the constantly growing fleet of chemical tankers, bulk carriers and container ships, whose ever-increasing size is cause for concern, exacerbates the risk of accidents and spills into the marine environment. Most of the time, a substance does not have one single behaviour but rather several behaviours due to its nature and environmental processes (wind, waves, current). For example, ethyl acrylate is classified as FED as it floats, evaporates and dissolves. However, the SEBC code has its limits. It is based on experiments conducted in the laboratory on pure products at a temperature of 20°C in fresh water. These conditions are quite different from those encountered in the case of incidents at sea, and the actual behaviour of the product may be quite different from its theoretical behaviour. 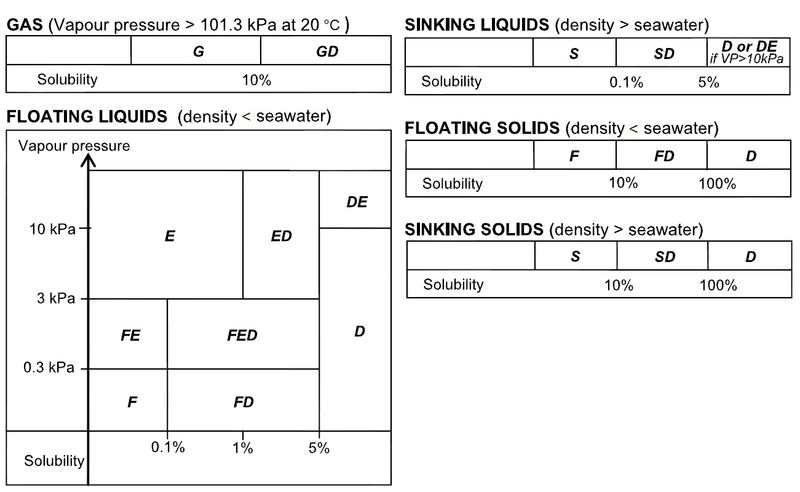 Therefore experimental characterization of chemicals behavior at different scales (ranging from laboratory to the field) is needed in order to come close to the actual conditions that may be at sea and thereafter better plan response efforts and pollution control.